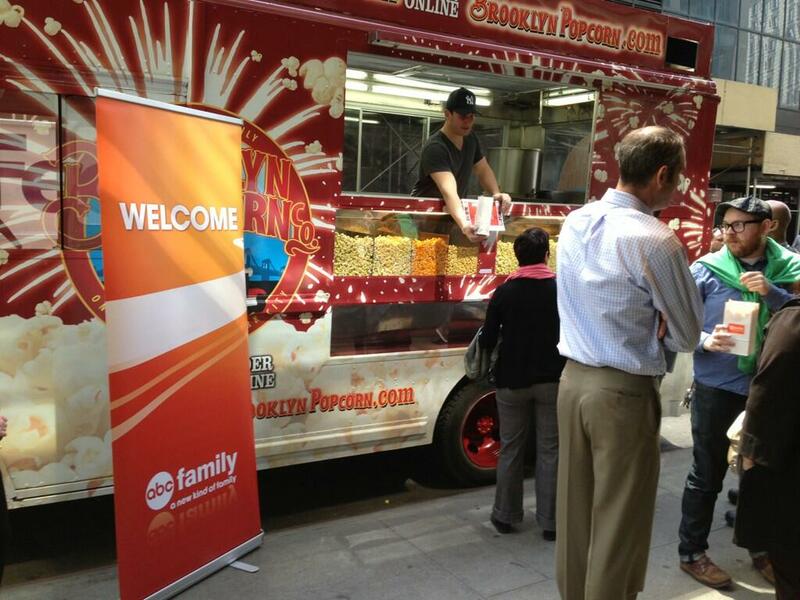 Brooklyn Popcorn got a chance to please the palates of Disney, ABC Family and Universal McCann employees in April 2013. We spent the day rewarding their hard work with some of our best flavors. Employees turned out by the dozens to sample and enjoy our delicious gourmet popcorn. It was a week filled with meeting lots of cool celebrities and TV personalities, along with turning some folks into new gourmet popcorn lovers. We enjoyed ourselves almost as much as they did gobbling it up. And, as usual, we served it up “Brooklyn-style” with a warm smile, great sense of humor and some awesome finger-lickin’ popcorn flavors to set the mood just right! Why not have Brooklyn Popcorn out at your next event? Book the truck for your next birthday party, corporate gathering or follow the truck to see when we are going to be in your part of town!